Introducing the DX-80 Business Telephone System, Comdial's all-in-one communications system that's affordable, easy to use, and loaded with great features-including integrated voice mail, live call screening, auto attendant, and more! Today's growing enterprises are faced with numerous business challenges: an increasingly competitive marketplace, heightened productivity demands, and improved customer service. Designed exclusively for small businesses, Comdial's DX-80 Business Telephone System provides a complete telecommunications solution to meet these challenges. In addition to offering a comprehensive feature set previously available only on high-end PBXs, the DX-80 also supports an integrated voice mail option based on Comdial's industry recognized Corporate Office Voice Messaging software. Together, this combination provides small businesses with a 'big company' telecommunications solution at a very affordable price. The DX-80 Business Telephone System grows with your business, enhances company productivity, and increases revenue opportunity. Click here for a PDF download of what dealers are saying about Comdial's DX-80. The DX-80 Business Telephone System delivers enterprise-grade productivity without the complexity, cost, and management responsibilities of a larger system. With over 100 standard features, this system is well suited to give your business a competitive edge. Built-In Caller ID - Name and number are displayed on both digital and analog telephone sets (requires caller ID service from your local telephone company), providing caller ID information regardless of extension type. Tenant Service - By using tenant groups, the DX-80 can be configured to operate as if two or three systems are deployed at a single site. Paired with the DX-80's two Music-On-Hold sources, the DX-80 is capable of serving multiple businesses while meeting the specific customization requirements of each. Fax Detection - The DX-80 supports automatic fax detection, thereby routing incoming transmissions to the appropriate extension and eliminating the need for a costly separate fax line. Automated Attendant Option - The automated attendant module handles incoming calls when a live attendant is unavailable. Callers are then able to direct themselves to the appropriate extension or department. Modem Option - The DX-80 system may be remotely configured using the modem module, reducing site visits and shortening customer response time. 30 Button Programmability - 30 programmable, dual-color LED buttons enable straightforward customization of your DX-80 telephone. Based on your preferences, a single press of a button can dial your favorite extensions, access your speed dial numbers, page a colleague, park a call, or select "do not disturb" mode. Busy Off Hook Voice Announce - Important messages can get through - even when you're on the phone. When enabled, a DX-80 system extension can make an announcement over your speakerphone even if you're already on a call (available on all extensions except attendant). Headset Jack - The DX-80 telephone includes a headset jack, making life easier for a professional who depends on constant communication. Combining the DX-80 platform with Comdial's industry-recognized Corporate Office Voice Messaging software makes for a complete small-business telephone solution. With a digital voice processing card installed directly inside the telephone system, the DX-80 provides fully integrated voice messaging without requiring the dedication of any telephone system extension ports. That means all 56 extension ports are available for digital and analog expansion. Call Recording - Allows subscribers to record active calls in real-time for future reference. Call Screening - Asks the caller to say his/her name and then announces the call to the subscriber. The subscriber can choose to accept the call, send the call to the subscriber's active mailbox or transfer the caller to an alternate extension. 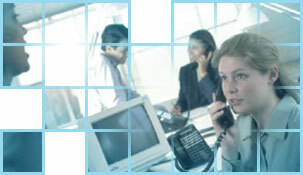 Call Queuing - Callers are given the option of holding for a specific extension when it is busy. The system politely keeps callers apprised of their position in line and offers options to leave a voice mail message, speak to the operator, or try another extension. Transfer Off-Premise - Automatically transfers a caller to an off-premise location such as the subscriber's home or mobile phone, reducing the number of missed calls. Pager Notification - Automatically pages subscribers when they receive messages in their mailboxes; helping to minimize customer response time. Caller ID Integration - Caller ID information captured by the voice mail is communicated during playback, and may optionally be used to automatically dial the caller at the touch of only two keys (requires caller ID service from your local telephone company). Dial-by-Name - Alphabetical directories allow callers to easily search for individual extensions or mailboxes through the use of touch-tones. Callers can select individuals by using the touch-tone pad to spell last or first name. On-Board Modem - Enables remote configuration and management of both the voice mail and DX-80 system (7270C model only). 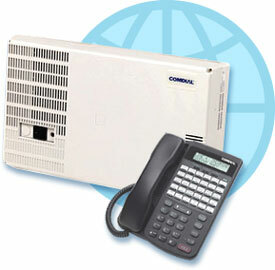 With Comdial's DX-80, small business get started with reliable, scalable communications technology. The DX-80's expandable architecture grows with your business, allowing you to purchase a system for today while leaving room to expand tomorrow. 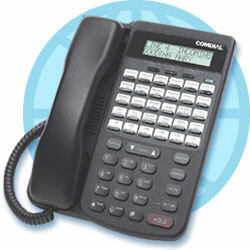 The DX-80 is a full-featured telephone system offered at an extremely affordable price. Whether you are starting with 4 employees or already have 40, the DX-80 is the sophisticated communication solution that can help your company project a positive image every time a call comes in. The DX-80 digital telephone couldn't be simpler to program or easier to use. An interactive LCD shows the name and number of each caller, plus gives you step-by-step instructions on programming your telephone. Thirty dual-color status LEDs indicate Active Headset, Mute, DND, and other call modes, and Fixed Feature buttons provide one-touch access to calling options such as Call Forward, Call Park, and Voice Mail. Plus, the small footprint of the DX-80 telephone frees up valuable desktop work space while providing a host of easy-touch buttons and call feature options for increased efficiency and productivity. Eliminate interruption with "Do Not Disturb"